BERTHANC (BERCHAN), According to all of the Scottish Kalendars, St. Berthanc spent his youth at Iona, and was later a Bishop of Kirkwall in the Orkneys. It appears that he reposed in Ireland circa 840, and his tomb is listed as being at Inishmore on the Bay of Galway, perhaps explaining the occasional surname of Fer-da-Leithe (man of two halves). BRYCHAN of BRYCHEINIOG (BRYCHAN of BRECKNOCK), (Date Unknown), the holy and right-believing King Brychan of Brycheiniog (Brychan of Brecknock) is famous for fathering twenty-four children (by three wives). All his children became saints, as did some of their children. St. Brychan was a great patron of the Church and observer of Her teachings, and was considered a good king by his people. As he entered old age St. Brychan abdicated his throne in favour of his eldest son and retired to Ynys Brychan (possibly Lundy Island - off the coast of Devon, England) to live as a hermit, where he reposed and was buried at an advanced age. CELESTINE (I), unanimously elected forty-third Pope of Rome in 422, St. Celestine focused much of his time as Pope defending orthodox Christianity from numerous heresies of the era. In addition to his opposition to the Manichaeans, Donatists, and Novatians, St. Celestine sent St. Germanus of Auxerre (31st July) to Britain to combat Pelagianism, later writing a treatise against semi-Pelagianism. He sent legates to the Third Œcumenical Council in Ephesus (431), at which the heresies of Nestorianism and Pelagianism were condemned. Following the Council, St. Celestine deposed Nestorius and excommunicated him. St. Celestine also sent SS. Palladius (7th July) and Patrick (17th March) to evangelise the Scots and Irish. St. Celestine reposed in 432. ELSTAN, a disciple of St. Ethelwold (1st August) at Abingdon Abbey (St. Mary's Abbey in Abingdon; then Berkshire, now Oxfordshire), in England. He was renowned as a model of obedience, and succeeded St. Ethelwold as Abbot of Abingdon. St. Elstan was later was consecrated Bishop of Winchester. He reposed in 981 and was buried at Abingdon. GENNARD, he received monastic tonsure at the Abbey of St. Peter / abbaye Saint-Pierre (later the Abbey of St. Wandrille / abbaye Saint-Wandrille) in Fontenelle, Normandy, where he was a disciple of St. Wandrille (22nd July). St. Gennard later served as Abbot of Fly (later Saint-Germer-de-Fly Abbey) in Picardy. He returned to Fontenelle to spend his last few years as a hermit. St. Gennard reposed in 720. MARCELLINUS, an imperial representative sent by Emperor Honorius (r. 393–423) to preside over, and then enforce the decree of the Council of Carthage of 411 against the Donatist heresy in Africa Proconsularis. The zeal with which St. Marcellinus carried out his assignment so infuriated the Donatist leadership that they falsely accused St. Marcellinus of complicity with their rebels. As a result, St. Marcellinus was arrested and put to death without a trial in 413. St. Marcellinus was a great friend of St. Augustine of Hippo (28th August), and dedicated his book City of God to him. 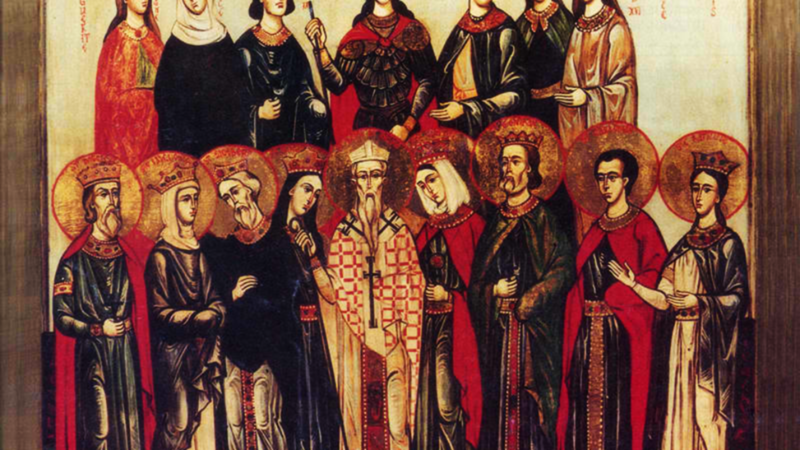 MARTYRS of SIRMIUM, (Fourth Century), a group of Christians martyred in Sirmium, Pannonia (present-day Sremska Mitrovica, Serbia). Nothing is known of them besides their names: Florentius, Geminianus, Moderata, Romana, Rufina, Saturus, and Secundus. NOTKER BALBULUS, a monk at the Abbey of St. Gall in present-day Switzerland, St. Notker had a speech impediment that earned him the nickname Balbulus, (the Stammerer). He was a great musician, best remembered for his Liber Hymnorum , a compilation of Sequences used in the Latin Liturgy, and credited by many for the actual introduction of Sequences to the Latin Liturgy. St. Notker reposed in 912. PRUDENTIUS GALINDO (PRUDENTIUS of TROYES), as a young man he fled from the Saracens in his native Spain, to Francia where he served the court of King Louis the Pious (r. 781–840). In his middle ages St. Prudentius dedicated his life to the church, becoming a monk and in 845 was consecrated thirty-fifth Bishop of Troyes. He served that See until his repose in 861. St. Prudentius is also remembered for his historically important work on Annales Bertiniani (Annals of Saint Bertin) , as well as his writings, including a treatise against John Scotus Erigena De prædestinatione contra Johannem Scotum , and Epistola tractoria ad Wenilonem , in which he defends his own theory of predestination. ULCHED (ULCHAD, YLCHED), (Date Unknown), a Welsh saint for whom the church of Llechulched in Anglesey, Wales is named. There is no further information on his life extant. URBAN, an abbot of the Monastery of Santiago de Peñalba in the Kingdom of León (in present-day Spain). St. Urban reposed circa 940. WINEBALD (VINEBAUD), an Abbot of the Abbey of Saint-Loup of Troyes (abbaye de Saint-Loup, de Troyes), near Troyes in Champagne, present-day France. St. Winebald reposed circa 650.